Lanzarote is probably the very best European winter hang gliding and paragliding destination. Pilots from all over Europe flock to Lanzarote to enjoy the dramatic and varied flying sites. To get some day to day flying updates check out the new hang gliding and paragliding blog page. Lanzarote is at the southern tip of Europe, as far south as the Sahara desert. Summer trade winds cool the island, in winter the weather changes. The winds go away, the air becomes clear and unstable and the many flying sites start to work. The flying season lasts from October right through to March. Flying does carry on right through summer but with less consistency. Lanzarote is one of the Canary Islands in Spain but is far further south than any other part of Spain. The Canaries are actually on the same latitude as the sahara desert but being in the middle of the Atlantic Ocean receive cooling sea breezes in summer which slow down in Winter creating perfect flying conditions. It takes only a four hour airplane flight from pretty much anywhere in Europe to Lanzarote. Fights to Lanzarote are becoming cheaper therefore a hang gliding or Paragliding holiday in Lanzarote is very affordable. Groups of experienced and learning pilots visit Lanzarote for the extremely consistent winter conditions. The weather is reliably warm. Winds are light, the sky is full of perfect cumulus clouds and the scenery is truly breathtaking. From absolute beginner to advanced pilot, Lanzarote has flying sites to suit everyone. Most sites have easy rounded hill launch take offs. Usually a light breeze is blowing to make things even easier. Landing options are also abundant close to all takeoff sites. The low level of building development in Lanzarote leaves masses of wide open spaces to fly over and land in. 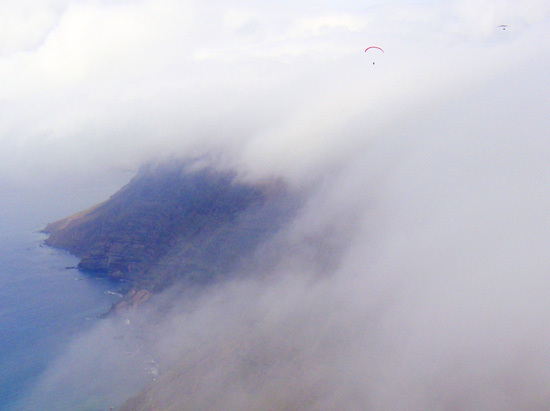 Many visitors double their annual flying hours on their hang gliding holiday in Lanzarote. Lanzarote has a unique landscape created by volcanic activity. The whole chain of Canary Islands grew out of the sea via an underwater fault line. Each island has its own particular kind of volcanic landscape but it is Lanzarote that best suits free flying. The combination of a long north south ridge line, numerous mountain type launches and plenty of wide open spaces in between make the island perfect for hang glider and paraglider pilots alike. There are flying sites to suit pretty much every wind direction. You will need some local knowledge to find all the sites and know when they are safe. If you want to fly together with your friends then it can be a good idea to find a guide who can take you to the best flying site for any given day, help you launch then be there at the landing area with a nice cool soft drink or beer. For both hang gliding and paragliding guides in Lanzarote get in touch with us via the contact form and we will get back to you. Using a paragliding or hang gliding guide in Lanzarote can save many frustrating hours finding where to fly. You can also save a lot of time by knowing if the day is not flyable rather than chasing around from one wrong spot to another. Using a Lanzarote hang glider guide can add tremendously to your enjoyment and flying time plus reduce waisted and lost days searching. If you are a visiting Paraglider pilot or group then we have a super experienced and expert pilot who can guide you every day plus give you some great tips on ground handling and flying. Finding the right Paragliding guide in Lanzarote could mean you flying everyday as opposed to searching for safe places to fly everyday. Lanzarote winds are fickle, they blow at different strengths over the island and can pick up quickly. Our guide flys almost everyday throughout winter and there is no one that knows paraglider flying on the island better. For a minimal fee of 40 euros per day for a paraglider guide in Lanzarote it is well worth the investment. To find out more visit our hang glider guide in Lanzarote or paraglider guide in Lanzarote pages. It is well worth the investment. If you are new to hang gliding or want to experience the amazing feeling of flying free then tandem hang gliding in Lanzarote is the thing for you. You do not need to know anything about hang gliding, just turn up listen to a short introduction and brief guide to what you need to do then off you go flying in the Lanzarote air. You will go up in a purpose built for two hang glider. Once in the air all you have to do is relax and enjoy the ride and amazing sensation of flight. The sport of Paragliding is now far more popular then hang gliding. Paragliders are very portable, easy to control and fast to learn how to fly. The same flying rules apply but to control and land a paraglider can be picked up quickly. If you want to get a feel for this amazing sport and see Lanzarote’s beauty from the air then come and try a Tandem Paraglide with us. Have an experience of a lifetime and create a holiday memory you will never forget. If you are looking for something else to do when the weather is no good for flying then you could try a motorbike enduro tour in lanzarote Lanzarote is a fantastic island for Enduro. All you need is a full motorbike license. The bike, all equipment and a guide will be supplied for a three hour Enduro tour around this fantastic island.